Google is obviously a household name! And yes, Google is everywhere – all the time – gathering data and pursuing their quest to organize all of the world’s information. But has Google moved into unchartered territories with toilet paper? 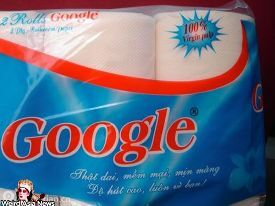 A Vietnamese company clearly has printed the name Google on their toilet paper packaging, but if this is actually associated with Google the search engine is still yet to be seen. The “Google” name on the packaging also has the “R” to show that it’s a registered trademark. hmmm….. This will be an interesting story to follow – so stay tuned!